10 years ago on this day Cornelia Aihara passed away. I loved this woman. She was a well-respected macrobiotic teacher and ran a learning center up in the northern part of California with her husband, Herman. I apprenticed with her in my 20’s and lived and breathed her teachings of yin and yang. To this day, I use these underlying principles in my life and work. My best memories are shelling peas with Cornelia at the wooden table as the sun went down. Walking barefoot in the morning grass wet with dew. 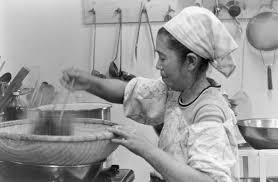 Being in her cellar, tending the huge vats of miso. Harvesting ume plums to make umeboshi vinegar. Hanging daikon in the shade to make takuan pickles. Chanting loud until my head dropped down into my belly. My favorite though is something she called ‘throwing the healthy business of eating’ out the window. She’d spontaneously take us to a diner and order banana splits and Belgium waffles. We sat and laughed, then walk back to the center, put on aprons, and make miso soup. Cornelia taught me that food is food. She helped me see that my health issues were more in my control than I had realized. That what went in had to come out…one way or another. Yin and yang. She taught me to not take medicinal cooking so seriously. No matter how serious the health condition. To create balance. Balance in the kitchen and in the bigger world. To keep the balancing act tipped in my favor. I’m trying Cornelia, each and every day.